Today I have post Get all child, grandchild etc nodes under parent array using PHP with MySQL. 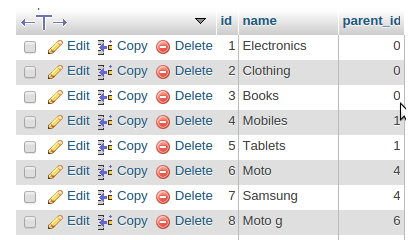 I was recently working on an E-commerce project there I have to implement unlimited category along subcategory level drop down a list. I have inserted all the product category and subcategory in the single table to view drop-down list I have used this code. Create sample table name like 'menu_list'. Insert some sample data. getChildren - Based on the parent id fetch all the child, grandchild nodes. "You have to dream before your dreams can come true."